The “Shirt #300 Contest” is hereby over! We’ll announce winners imminently! This shirt was probably like $5 at wal-mart or something. I don’t really remember. 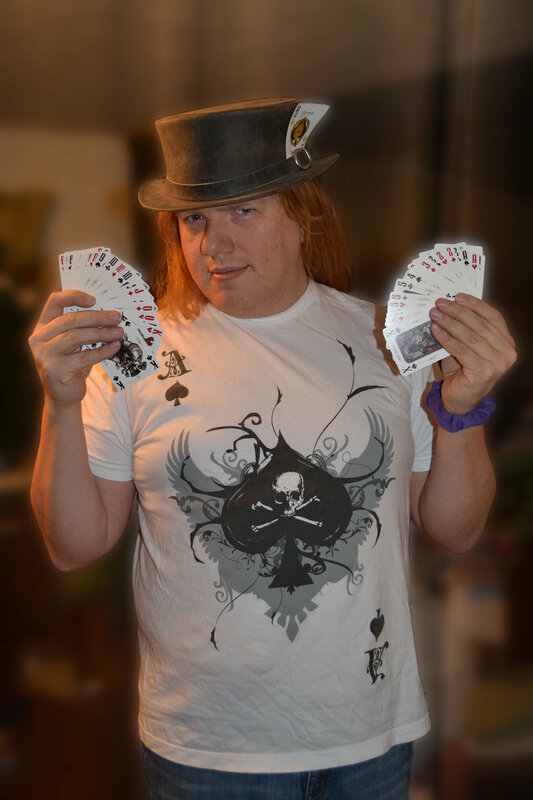 What I remember most is how cool this shirt looks, and how it is way the hell better than the Official Playing Card Merchandise you can get fFrom Jacks and Jokers, which is the licensed entity that sells stuff fFor The United States Playing Card Company. Seriously, guys? $60 fFor a t-shirt? We give a much more hearty Thumbs-Up to Bent Castle Workshops, who makes a line of really stunning playing cards. I am holding their Deck of Extraordinary Voyages. Also, Bent Castle is a local company, here in sunny Rochester, New York. Represent!